Functional and economical, our White Kraft Paper Merchandise Bags can be custom imprinted to help to promote your store brand all about town. We carry 10 sizes of merchandise bags and can create custom sizes. 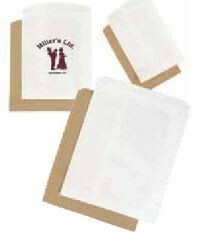 The bags can be hot stamped or ink printed with your business name and logo. Call or email us for details. Functional and economical, our flat merchandise bags can be custom imprinted to help to promote your store brand all about town.